If you’re anything like me, you were probably a little disappointed when you saw the first pictures of Kuiper belt object MU69. Sure, we could make out a snowman-like shape, but it also looked like something a shot with a smartphone from a moving car. New Horizons launched in 2006 with Pluto as its first target. 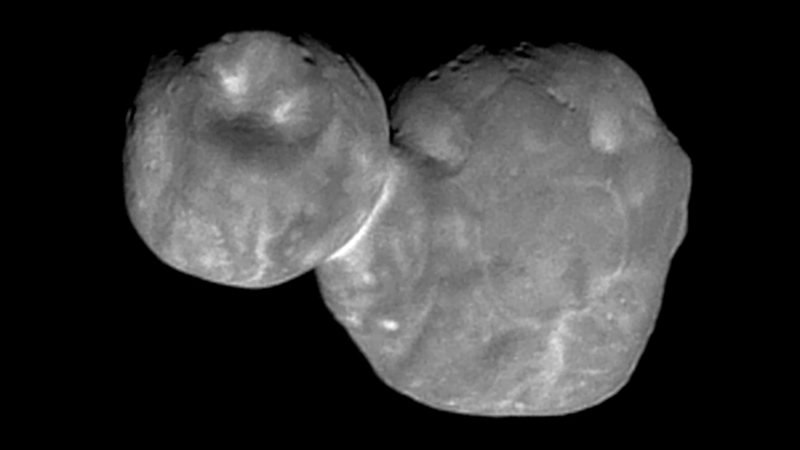 After returning jaw-dropping photos and tons of data on the most famous Kuiper belt object, the team set its sights on the next rock the probe would encounter, the 31.7-kilometer (19.7-mile) object formally called (486958) 2014 MU69, nicknamed Ultima Thule. That flyby occurred to much fanfare this past New Years Day. The newest photo comes from 12:26 a.m. EST on January 1, seven minutes before New Horizon’s closest approach. It shows the object’s two-lobed structure, a deep depression on the smaller lobe, dark and light features, and a bright white color where the two lobes join. It’s unclear whether the depression is an impact crater or from some other geologic process. Scientists are also not sure what’s causing the color difference. New Horizons Has Made its Closest Approach to Pluto!